London, England (CNN) -- The eruption of an Icelandic volcano, which had slowed in recent days, strengthened Monday, spewing a new cloud of ash that officials said was heading toward the United Kingdom, possibly posing a renewed threat to air travel. "This demonstrates the dynamic and rapidly changing conditions in which we are working," the United Kingdom's National Air Traffic Service said in a written statement. "Latest information ... shows that the situation is worsening in some areas. Based on this information, the situation for Northern Irish airports for the morning is uncertain, due to the new ash cloud." The statement came after millions of travelers stranded on both sides of the Atlantic were given a glimpse of hope earlier in the day, with officials announcing a plan to partially reopen European skies to air traffic. However, Iceland's Eyjafjallajokull volcano spewed a new cloud of ash up to 15,000 feet in the air. Scottish airports should be available Tuesday morning as announced, the air traffic service said, and more UK airspace may become available Tuesday afternoon "although not as far south as the main London airports." The situation is likely to change overnight, officials said. "We are working closely with government, airports and airlines, and airframe and aero engine manufacturers to get a better understanding of the effects of the ash cloud and to seek solutions," the air traffic services said. Earlier, European Transport Commissioner Siim Kallas said, "from tomorrow morning on we should see progressively more planes start to fly. And this is good news for Europe's stranded passengers, good news for airline industry and other sectors hard hit by this crisis." Authorities warned that Tuesday's reopening will not bring air traffic to its usual levels. European Union officials agreed to a plan involving three zones: one that remains closed, one open to all flights and one open only to certain flights. The measures will go into effect Tuesday morning, Kallas said. There will not be "any compromise on safety," Kallas said. He called the current situation "unsustainable" and said it is clear "we cannot just wait until this ash cloud dissipates." Kallas rejected suggestions that European Union ministers should have acted more quickly to allow flights to resume. It took Sunday's test flights to provide the information necessary, he said. Since the volcanic eruption worsened last week, sending an ash cloud into the skies, airlines have been losing at least $200 million a day, according to the International Air Transport Association, the trade group representing airlines. Airports had lost close to 136 million euros ($184 million) as of Sunday, said Olivier Jankovec, director general of Airports Council International, Europe. More than 6.8 million passengers have been affected, Jankovec said in a statement, adding that the effect is worse than after the September 11 terrorist attacks on the United States. 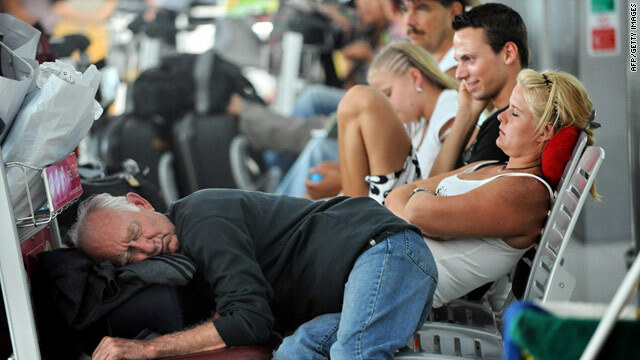 Thousands of people have been living in airports. "I have been living out of my carry-on for five days," said Paulo Wu, stranded in Amsterdam, Netherlands. After two nights sleeping on a cot at the airport, he was able to get into a hotel with an actual bed, he said. "I have no bags. My bags are somewhere, I think, at the airport. I just have my carry-on," he said. Britain dispatched Royal Navy ships to bring home some stranded British travelers, including members of its military, Prime Minister Gordon Brown said Monday. The HMS Albion will arrive Tuesday morning in Santander, Spain, "where its primary role will be to collect U.K. service personnel who have recently left the ongoing operation in Afghanistan," Britain's Ministry of Defense said in a statement. The HMS Ocean is in southern British waters and standing by for orders, while the HMS Ark Royal, which had been deployed on an exercise off the northwest coast of Scotland, was sailing south. Brown said he spoke to Spanish Prime Minister Jose Luis Rodriguez Zapatero about using airports in Spain, which have been less affected by the air travel chaos, as a hub through which to bring people back to Britain. Further information will be released later Monday, Brown said. Along with the EU announcement that skies were open, several governments and airlines announced specific plans to resume some flights. Announcements poured in from Finland to Belgium to France. Germany's Lufthansa airline said it would send 50 planes currently in international destinations back to Germany, and they would bring back up to 15,000 passengers. The flights will begin late Monday, with the first set to land early Tuesday. Some domestic flights would also begin Monday night, the airline said. At the airport in Frankfurt, Germany, some Lufthansa workers took covers off plane engines. A cargo plane pilot said that one or two flights per day have operated out of Frankfurt and that no ill effects were seen from the ash cloud. The planes were outfitted with special foils that ash would stick to. British Airways said it would resume some flights in and out of London's airports beginning at 7 p.m. Tuesday (2 p.m. ET). A British Airways test Sunday found no damage to the aircraft at a variety of altitudes, the airline said in a statement Monday. 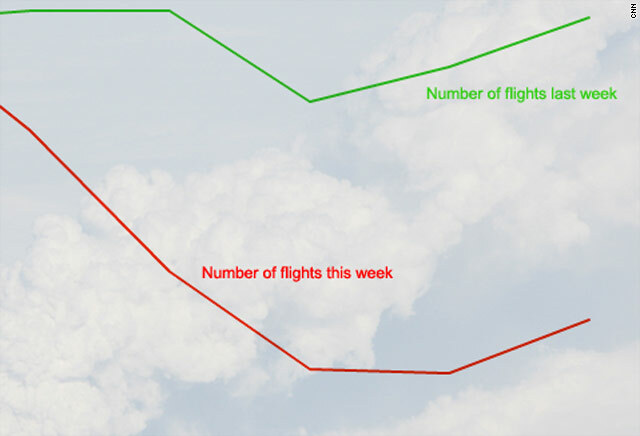 "The analysis we have done so far, alongside that from other airlines' trial flights, provides fresh evidence that the current blanket restrictions on airspace are unnecessary," said Willie Walsh, British Airways' chief executive. Finland's Ministry of Defense, however, said in a statement Monday that Finnish Air Force F-18 Hornet fighters that conducted test flights over northern Finland on Thursday showed effects from volcanic material. "A post-landing inspection revealed accumulations of powdery volcanic dust in the aircraft's air intakes," the ministry said. 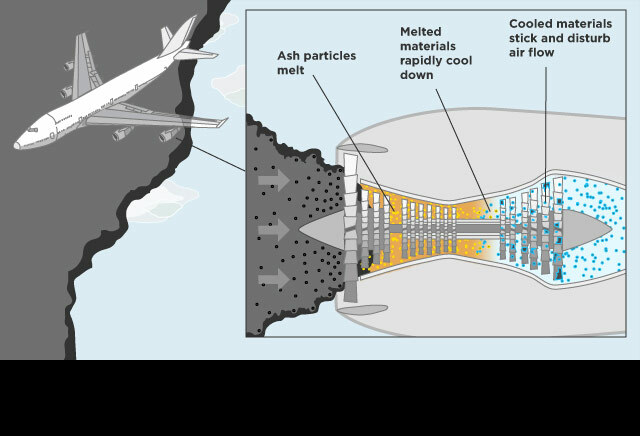 Officials used a fiberscope to closely examine the engines of one aircraft, and "imagery ... indicated that even a short-duration flight inside an ash cloud may cause substantial damage to aircraft engines." The engines will undergo a more thorough inspection, the ministry said. Meteorologist Derrick Ryall of the MET Office in London said there is no "defined safe limit" for volcanic ash. "No one has said what a safe limit for aircraft is, so therefore it's very difficult for these judgments to be made," he said. Would you be scared to fly through the ash cloud? The air disruptions have led to cancellations of numerous high-profile visits. Many world leaders, including President Obama, were unable to attend Sunday's funeral services for Polish President Lech Kaczynski. U.S. Secretary of State Hillary Clinton canceled plans to travel to Helsinki, Finland, a State Department official said. Clinton was set to depart Washington on Tuesday. No decision has been made about whether she will keep plans to visit Tallinn, Estonia, the official said. If she does, she will not depart before Wednesday.